A warming dessert with autumn berries that's deliciously indulgent, especially when served with cream. A great way to use up leftover bread. Preheat the oven to 180°C, gas mark 4. Mix the caster sugar with 1 teaspoon of the cinnamon and sprinkle half of this mixture into the base of a deep 1½ litre ovenproof dish. Scatter half the blackberries over it. Spread the bread on one side with the butter and cut each slice into 2 triangles, leaving the crusts on. 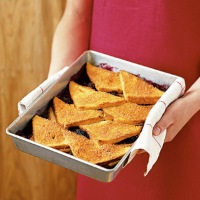 Arrange half of the bread in overlapping slices over the blackberries and press down to squash the fruit slightly. Add the remaining blackberries then sprinkle the rest of the sugar/cinnamon mixture, along with the lemon zest, over the top. Add the remaining layer of bread and press down. Use a fork to lightly whisk together the milk, cream and beaten eggs, then carefully pour the mixture evenly over the bread. Mix the remaining cinnamon with the demerara sugar and scatter over the top. Bake for 40 minutes, or until the crust is golden and crisp and the fruit is bubbling. Serve with fresh pouring cream. This can be assembled several hours in advance. Keep covered in the fridge and sprinkle on the demerara topping just before cooking. Use 450g fresh raspberries or blueberries instead of blackberries. Omit the cinnamon and add a handful of chopped candied peel. Be adventurous and try this rich spicy pudding with a sweet sparkling red - surprisingly good with many desserts as well as chocolate.